Religious Freedom in an age of Realpolitik. The following address, entitled Religious Freedom in an Age of Realpolitik, was delivered on Saturday 25 October 2014, to the annual conference of the Australian Christian Lobby. It is Australian Christian Lobby's vision "to see Christian principles and ethics accepted and influencing the way we are governed, do business and relate to each other as a community. "ACL aims to foster a more compassionate, just and moral society by seeking to have the positive public contributions of the Christian faith reflected in the political life of the nation." Entitled Speak Up, this year's annual conference had a specific focus on religious liberty. It seems to me that the topic of persecution is one of the most unpopular topics in the Church today. One reason why the topic of persecution is so unpopular and so difficult for many Western churches and Western Christians, is because the Western church is immersed in a media-obsessed culture – in which character has become less important that personality (persona) the image that is presented. The image most prized by our culture seems to be that of person who is always chirpy, bubbly and carefree to the point of being care-less. It doesn’t even matter that it’s all completely fake. It is imperative that the Church rise above this. Another reason why the topic of persecution is so unpopular is because the Western church has become enamoured with ‘celebratory worship’ – a style of worship that, while being wonderfully joyful, has no place for indignation or lament. It essential mandates that everyone who enters the auditorium, must have an upbeat experience (theoretically that will keep them in the faith, and keep them coming back). Another reason why the topic of persecution is so unpopular is because the Western church is clinging to an easy, triumphalist Christianity. There are far too many false teachers chirping, “‘peace peace’ when there is no peace” and promising believers, “Jesus would never let anything bad happen to you”. Churches that teach, preach and sing that message – cannot handle the topic of persecution; for it sets up an intellectual conflict. The Bible, however, is absolutely riddled with material on persecution. “Why do they righteous suffer?” is the eternal cry. The “valiant man” of Lamentations 3 (possibly the prophet Jeremiah himself) had been taken captive by the enemy who forced him into slave labour, broke his teeth and abused him until he cowered in the dust . . .
Look at the suffering of Christ in the gospels and of the Apostles in the book of Acts. All of the Apostles were eventually martyred -- except for John, who was exiled to a prison island for life. Indeed, history is replete with waves of persecution. Jesus warned us that persecution would come and he calls his followers to take up their cross. YET still, persecution is a no-go area in many churches. But to be silent about persecution is to live in denial – in unreality. For the reality is, things are not good. In fact the situation facing most Christians today is intolerable, totally unacceptable – truly lamentable. I believe the Western church’s failure / inability / refusal to confront the reality of persecution (and even suffering in general) is one of the reasons why Western churches are shrinking. If we can’t face reality – then we are irrelevant – and certainly not helpful! It is imperative that the Church END DENIAL: things are not fine. Then there is the problem that the Church doesn't think it needs to bother with this topic. In fact the Church has grown accustomed to the idea that the world will save the Church. If we can just inform the UN, then the UN will save the persecuted church. If we can just get an audience with the Pres of the US – then Captain America will save the persecuted church. If we can inform the world’s Human Rights NGOs and get reports into the media etc etc, then the goodness of humanity will take over and they – good people – (i.e. someone else) will save the persecuted church. When the Cold War ended with Christian America as the world’s sole superpower, many Christians – especially Protestants / evangelicals truly believed that God was in the process of transforming the world through the military and economic might and political leadership of the US. In November 1998, when the US congress passed the International Religious Freedom (IRF) Act, which tied US foreign policy to international religious freedom, mandating sanctions for states / regimes deemed to be severe persecutors / or violators of religious freedom -- Christians were more convinced than ever that God was in the process of transforming the world through politics, as distinct from through transforming power of the Gospel. For a decade, the US IRF Act did provide many vulnerable minority Christians with a veil of cover/protection as it gave dictators a reason to reign in hostile elements and to enact reforms and pursue at least a modicum of justice for the sake of US aid and trade. Well those days are now well and truly over. The power of the IRF ACT was US economic leverage – when the US housing bubble burst – in Aug-Sept 2008, the financial crisis ripped the teeth right out of the Act. Persecution escalated immediately. Christian woman, Pakistan, March 2013. We have reached a confluence of trends: the phenomenal growth of Christianity in the non-West has converged with the radicalisation of Muslims; the coming of age of religious nationalism; the ascendancy of Communist-ruled China and the ascendancy of Shi’ite theocracy-ruled Iran -- and now we are witnessing the loss of Western influence (which is itself a symptom of the decline of Western civilisation, a consequence of Culture Change). To summarise: we have more believers – living in increasingly hostile environments – and the West is powerless to help them. So, after a momentary historical anomaly – the Church must face the reality that we have to live with realpolitik = i.e. politics based on power and “interests” rather than ideals. Realpolitik is the reason why no one can stop China returning to its old ways of bulldozing churches, incarcerating pastors and torturing high profile dissidents. Realpolitik is the reason why no one can stop Iran abusing, incarcerating, torturing and executing political and religious dissidents. The reality today is that the US needs Iran more than Iran needs the US! Realpolitik is the reason why no can stop Vietnam and Laos forcing Highland Christians to renounce their Christianity. Realpolitik is the reason why no one can get the Pakistani government to pursue justice for Pakistani Christians who have lost everything on account of Muslim pogroms. Realpolitik is the reason why no one can get the Egyptian regime to guarantee security for Coptic communities in Upper Egypt. Realpolitik is the reason why religious freedom is on the decline in BJP-ruled India. Realpolitik is the reason why Western governments are reluctant to speak of the Burmese regime’s military abuses against the Christian Kachin. We wouldn’t want anything to get in the way of our ability to exploit Burma’s resources, markets – and we especially wouldn’t want Burma drifting back into China’s sphere of influence. Realpolitik is the reason why no one can stop the Government of Sudan's genocidal jihad against the predominantly Christian Africans of Nuba Mountains! We are powerless! Realpolitik is the reason why Western governments can’t or won't stop torture and tyranny in Papua. We wouldn’t want to scuttle an arms deal, or cause geo-strategic Indonesia to shift into China’s sphere of influence. I could go on like this all day . . . .
Of course Western governments do raise these issues -- as they should -- in Human Rights dialogues and in diplomatic meetings. But the truth is, it is more for domestic consumption and a deep sense of moral duty than from any expectation that the situation can be changed with “mere words”. In 701 BC – as the Army of super-power Assyria advanced across Judah, Sennacherib, king of Assyria, boasted that he had Hezekiah, king of Judah “holed up in Jerusalem like a bird in a cage”. When the Assyrian Rabshakeh asked Hezekiah, “Do you think mere words are a strategy and power for war?” (Isaiah 36:5) he was saying, "Get real, Hezekiah. This is what realpolitik looks like. I will crush you because I can. There is no-one coming to save you. There is one who can stop me. So face reality and surrender." And today, in Iran, China, Saudi Arabia, Nth Korea and so many more – regimes are saying: "We will treat Christians however we like. There is no-one coming to their rescue. There is no-one who can stop us. So get over it; for this is how it is going to be from now on and you can’t do a damn thing about it." And they are right. We can’t. Makes you feel sort of hopeless doesn’t it? Good! For that is exactly where we need to be; for . . . it has never been God’s plan that the world should save the church. God saves his people by grace through faith -- that is not just God’s paradigm for personal salvation, it is God’s paradigm for everything. In the latter part of the 8th C BC when God’s people were imminently imperilled, God said “Trust me and I will save you.” But they wouldn’t do it. “We’ve out-grown faith” they said (Isaiah 28) “faith is for children. We do politics now.” And they put their trust in all the things we put our trust in today: diplomacy; military might (Egypt); collective security, grand alliances, spiritually rebellious projects of self-sufficiency and in the cultural and economic power of great cities. And it all failed – and the enemy flooded Immanuel’s land right up to its neck, just as Isaiah said it would (Isaiah 8). It was hopeless – the battle was at the gate and the fall of Jerusalem was imminent and inevitable – until Hezekiah remembered that there is another option, that there is another player. In humble repentance and faith, Hezekiah appealed to the Lord and the battle was turned back by grace in response to faith. 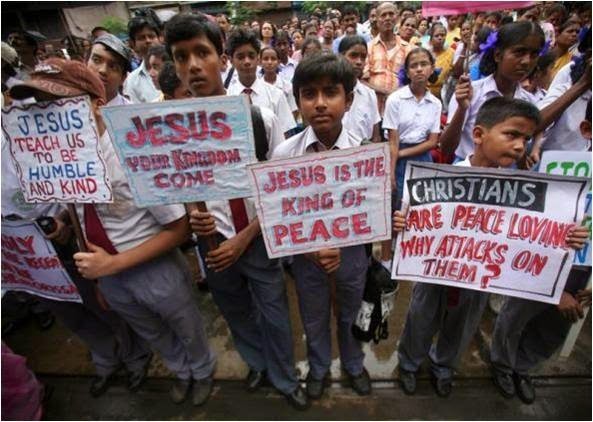 Indian Christians protesting violent persecution. The world will not and cannot save the persecuted church. Neither can the church of herself, operating in her own strength, save the persecuted church. The issue is who or what do we trust. We demonstrate our trust in the Lord through obedience to his word. So we must seek the Lord’s will and DO it – trusting him for the outcome. Give generously – sacrificially (Deut 15:10 and 2 Sam 24:2) – not letting your left hand know what your right hand is doing (Matt 6:3). But though we work – we do not put our faith in our works. The prophet Isaiah can be our role model in this. For in obedience to the Lord’s command, Isaiah lobbied the king – first Ahaz (735 BC) and then Hezekiah. But he never put his faith in those kings, or in his diplomacy, or in the political or diplomatic process. He always only ever rested his faith in the Lord. Everything we do is useless – unless the Lord blesses it. And so prayer must be integral to every stage of everything. The world has changed – and so must we (the Church) – we need to change gears. We need to face the reality of persecution and engage with the persecuted through provision of aid (giving generously, sharing the burden), involvement in advocacy (speaking up) and the serious business of intercessory prayer (advocacy in the courts of the Lord). We must welcome indignation and lament into our worship, which will give our worship a depth and breadth that I can assure you, will go a long way to making worship more relevant to the human experience. While this persecution is unprecedented in our lifetime, it is not unprecedented. Waves of persecution have been breaking over the church ever since its inception. What is unprecedented today is the global nature of the persecution. But equally as unprecedented is the global connectedness of the church, such that the Church in Australia can learn of a great need on the other side of the world – in real time – and respond immediately – for the saving of many lives. All proceeds from the sale of books today [25 Oct] will be going to Christian Faith and Freedom's fund for Christian IDPs in Dohok in the far Nth of Iraq. While many are holed up in church halls and monasteries and schools – being cared for by local churches – others are in camps. These Christians fled Nineveh at the height of summer, so in shorts and T-shirts. Winter looms – the rains have already set in; soon it will be snowing. Otherwise - Books are available on my website – and if you want to donate to the CFF fund for Christians in Dohuk [or Syria, or the Nuba Mts, or Burma . . . ] but can’t do it now – then please take a CFF brochure or give through the CFF website. Please stay, informed – sign on to my weekly emailed RLPB – and please, get your small group and your church involved. Please, remember the persecuted. Elizabeth Kendal's message in solidarity with Syrian and Iraqi Christians. 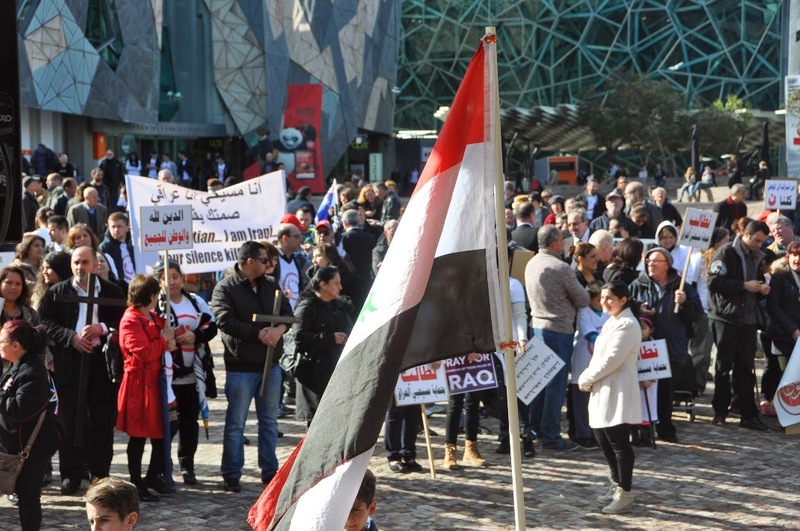 On the afternoon of Saturday 2 August, several thousand Syrian and Iraqi Christians gathered in Melbourne's Federation Square to stand in solidarity with Christians suffering severe persecution under ISIS (the Islamic State of Iraq and al-Sham/Syria -- now known as IS). Religious Liberty Prayer Bulletin (RLPB) 250. Religious Liberty Prayer Bulletin (RLPB) 265. Religious Liberty Prayer Bulletin (RLPB) 273. For many of those present at the rally, the victims are not merely their co-religionists, but their relatives: grandparents, parents, cousins, aunts, uncles, brothers and sisters. They were joined in Federation Square by a spattering of sympathetic fellow Christians, but not nearly enough. The rally included a series of short speeches given by guest representatives from various religious, ethnic, political and advocacy groups. 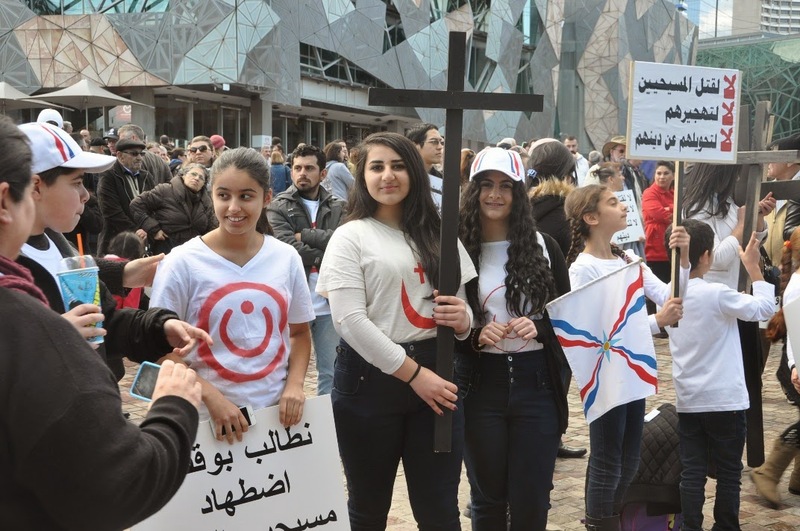 Following the speeches, a group of Assyrian youths presented a short skit in which they re-enacted the way ISIS treats Christians. 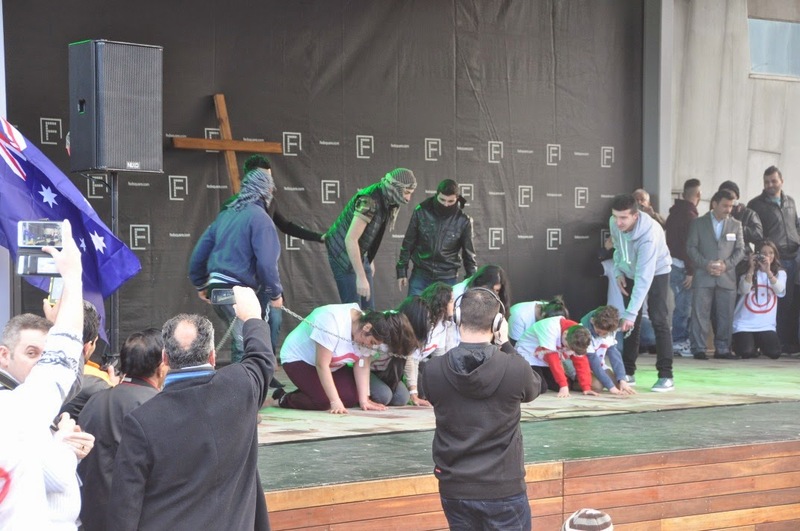 After enacting their capture, humiliation and massacre, the Christian youths rose up, lifted up a giant cross and declared: "We are Christians and we are proud! 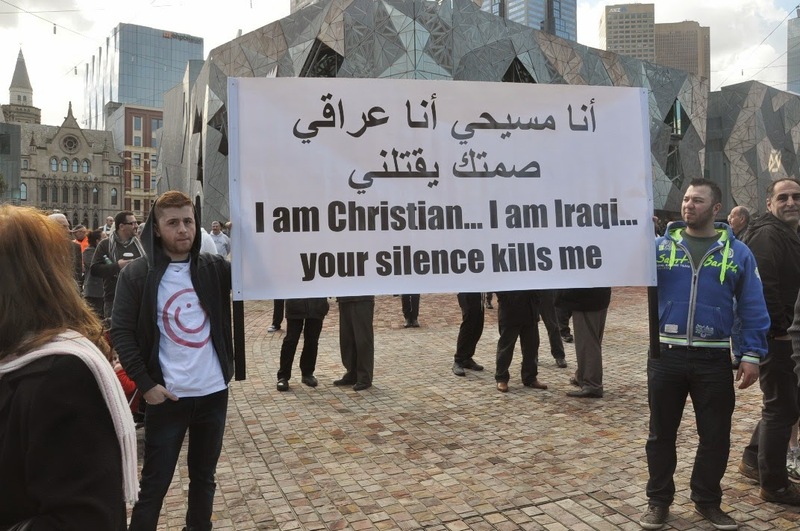 Save Iraqi Christians!" I was greatly honoured to be given the opportunity to address the rally. 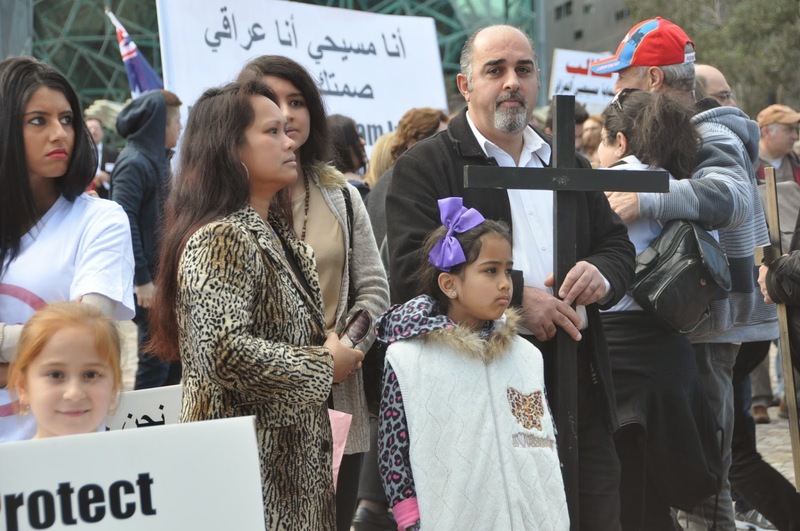 "The March in Solidarity for the Persecuted Christians of Iraq". Thank-you for giving me this opportunity to address this gathering. You have heard on the news that for the first time in the history of Iraq, Mosul is now devoid of Christians. But I want to tell you, the crisis stretches far beyond Mosul. This year, Christians have been driven out of towns as far west as Armenian town of Kessab in Syria's the far north-west corner. Even now, remnant Christians are being driven out of towns right across Syria’s north and east – out of Al-Raqqah, from where photographic evidence of public executions and even crucifixions have emerged, and out of the Al-Hassekah and Deir al Zour. 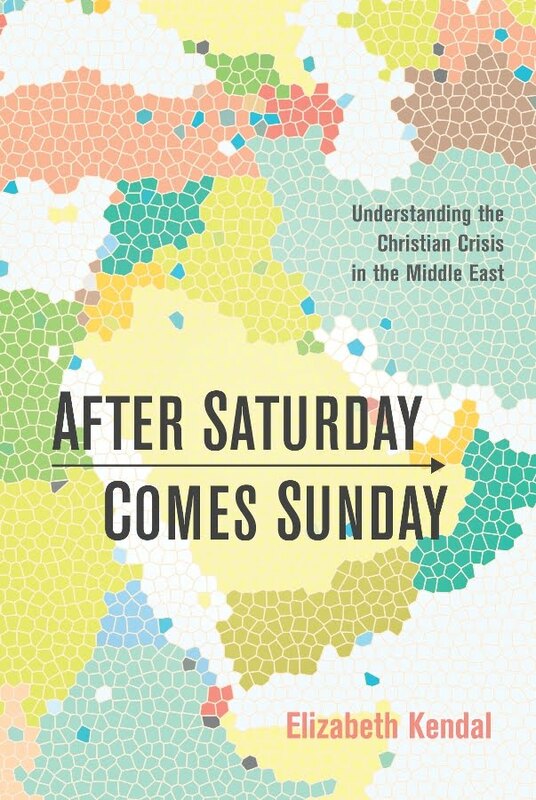 In Iraq they are being driven out of Nineveh, while a decimated remnant survives in Baghdad. Indeed, across the entire Christian heartland of Upper Mesopotamia, those who choose to remain Christian have no choice but to flee. This is the land where the disciples of the Jesus Christ were first called Christians (Acts 11:26). This is the land from where mission was launched west in Europe and east in to Persia and China. Christianity has been decimated in its historic heartland, in our lifetime and before our eyes. What’s more, Christianity is in the process of being eradicated from its historic heartland. All we need to do for this to eventuate is nothing. It will happen – unless we step up and be the Church God demands we be and has gifted and empowered us to be. The day has arrived when Church passivity must end. We are exhorted in Galatians 6:2 – “bear one another’s burdens, for in this way you will fulfill the law of Christ” / the law of love. And unless we want to hear the Lord say to us, “Whatever you did not do for the least of these children of mine, you did not do for me” – then we had better get serious. It is possible that those who have fled their homes and lands in recent years -- in order to save their lives -- may never see their homes again. Upper Mesopotamia is in the eye of a very big storm that will probably wreak havoc for a long time yet. As Christians, all of us are called not merely to live righteous and just lives – but to advance righteousness and justice in the world. And so, following the manner of the prophets and apostles, we lobby the king – we exhort our leaders to do what God expects them to do: “speak up for those who cannot speak for themselves . . . plead the cause of the needy.” (Proverbs 31:8-9). After all – what will this Assyria of Isaiah 19 be – but the work of HIS hands. When the Israelites lamented over the fall of Jerusalem – crying “God does not see, God does not care” (Lamentations 1-2), God exhorted them to remember, saying (Isaiah 40:27f): Why do you say God doesn't see and God doesn't care? Remember! "The LORD is the everlasting God, the Creator of the ends of the earth. He does not faint or grow weary; his understanding is unsearchable." In other words: he sees! Remember – that your faith might be energised, that you might soar in his strength. So the Australian Church I say – get to work! Don’t be passive observers of suffering! Don’t leave the sacrifice to others! And to my Iraqi and Syrian brothers and sisters in Christ, I say – arise! May we stand together – One Lord – One Body. Now a spate of suicide bombings in which the all bombers have been teenage girls has caused a shroud of horror to descend upon the mothers and fathers of the Chibok abductees, who are left to wonder, "Could these be our girls?" A girl estimated to be 15-years of age, blew herself up near a temporary university site. It is alleged she was targeting police; however she killed no-one but herself. A teenage girl joined a queue of women buying kerosene at the petrol station before blowing herself up, killing herself and three others and wounding six. Hours later a girl estimated to be 18-yrs of age blew herself up in a trade show / shopping mall, killing no-one but herself. Two girls entered two mosques in the town of Potiskum, killing thirteen worshippers. Police arrested three suspects, believed to be members of Boko Haram; one of the three was a ten-year-old girl with explosives strapped to her body. A teenage girl blew herself up at the Kano Polytechnic, killing six and critically wounding six others. The victims were all students who had gathered to collect their call-up letters for the National Youth Service Corps. Previously, on 25 June, Boko Haram claimed responsibility for a bombing in Lagos which was also carried out by a female suicide bomber. Nigerians spoken to by Nigerian Tribune wondered why Boko Haram might be using teenage girls as suicide bombers. Some posed the question, "How can we be sure they are not the Chibok girls kidnapped so long ago?" A human rights group has called on the Federal Government to conduct comprehensive forensic test of the corpses of the dead bombers so as to ascertain their identities. "This," the group told the Tribune, "was to disabuse the minds of observers already insinuating that the female bombers may be from the kidnapped schoolgirls, who might have been hypnotised." Others have expressed fears that the Chibok girls might have been "indoctrinated or coerced" to become suicide bombers. The fact is, the girls would not need to be hypnotised or indoctrinated. Their captors would only need to assure the girls that there is no escape, and, that if they fail to do as they are told then their mothers and sisters will be raped and their fathers and brothers will be killed. That would be enough to make a young girl kill herself. Islamic militants around the world have been exploiting young girls like this for years. The fact that some girls managed to kill only themselves could indicate that they might actually have been trying quite hard to not kill anyone. Political blogger Japheth Omojuwa decried the use of young girls as suicide bombers and questioned whether Boko Haram might have simply found a way to save their men for combat. The Federal Government attempted to douse anxiety on Wednesday by denying, without evidence, that the suicide bombers had anything to do with the Chibok girls. But not everyone is convinced. As it turns out, the 10-year-old girl arrested strapped with explosives in Katsina State on 29 July, was a Muslim child in the company of her Muslim sister (aged 18) and a male. Personally, I suspect this case is a separate case, unrelated to the others. The identities of the dead girls must be ascertained by expert forensic testing as soon as possible. Regardless of who the dead girls were, they were still young girls. That Islamic fundamentalist militants are willing to use young girls as bombs and human shields only proves that their ideology is not merely morally vacuous, but profoundly evil. Pursuant to the publication of Religious Liberty Prayer Bulletin 270 (23 July 2014), "A Test For India in Chhattisgarh", the following article is being released to provided background on Hindutva. As evidenced by the Hindu nationalist Bharatiya Janata Party's (BJP's) landslide win in the April-May 2014 polls, India is changing, in more ways than one. 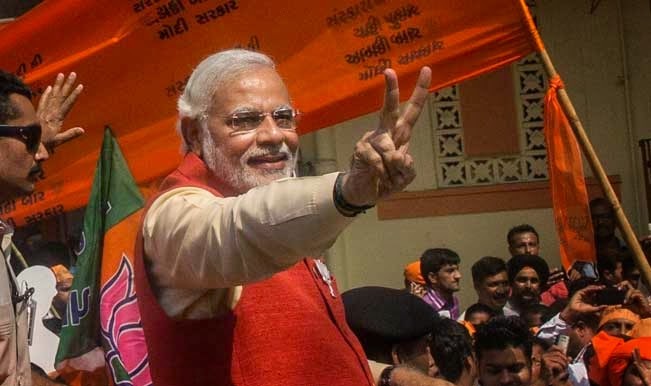 Not only did the BJP win 282 of 540 Lok Sabha seats, giving it a simple majority in its own right, but it managed to break out of the Hindu heartland and secure votes from all quarters - geographic and socio-economic. When the BJP appointed Gujarat Chief Minister Narendra Modi as its presidential candidate in September 2013, many scoffed, doubting such a controversial, divisive and sectarian figure could lead the BJP to electoral victory. Most analysts believed the Indian electorate would never embrace Modi, especially not the minorities (who are fearful of him) or the educated middle classes (who should know better). 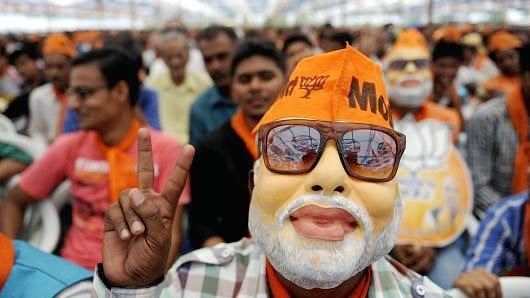 At a BJP rally in Gujarat on Tuesday 17 Sept 2013, the hugely charismatic Modi managed to persuade some 40,000 Gujarati Muslims to join the party. At a rally in New Delhi on Sunday 29 Sept, the charismatic Modi addressed a crowd of more than 200,000 mostly middle class youths who responded to his lofty promises with "frenzied" excitement. It was, writes political analyst Sanjay Singh, "a public rally, the likes of which it had not seen in many decades". Anil Padmanabhan, another political analyst, remarked (29 Sept 2013) that Modi is connecting with youths and "rapidly becoming a national phenomenon. . . Modi has transcended his party and become a personality". Narendra Modi is a self-confessed and proud hinduwadi (supporter of hindutva, i.e. militant Hindu nationalism). Hindutva is an ideology which maintains that India -- indeed the entire subcontinent -- is the homeland of the Hindu race. Denying that there ever was an Aryan invasion, hindutva does not recognise the mostly animist, tribal adivasis (literally: first inhabitants) as the indigenous people of India. Rather, it labels them vanvasis (literally: forest dwellers) and counts them as Hindus, maintaining that the Hindu race is indigenous to India. Further to this, Hindutva defines a true Hindu as one who acknowledges that India is both his Motherland and his Holy Land. Hindutva maintains that an Indian (a Hindu) who does not recognise India as his holy land cannot be a loyal citizen, for their loyalties are divided. The missionaries of Hindutva work tirelessly to persuade the traditionally animist adivasis (tribals) that they and the Hindus really are "one people, one nation, one culture" -- i.e. one race. 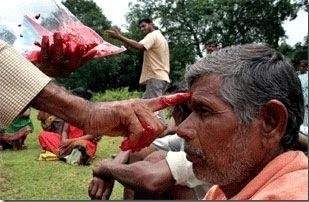 They work to convince the tribals that they are really Hindus whose religion has become corrupted over time. At the same time they Hinduise the adivasis' animistic practices so they don't need to change their practice, just see it as Hindu and self-identify as Hindu. 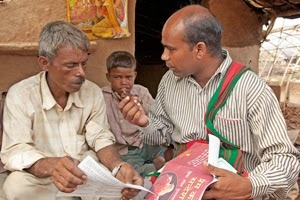 As for Christians, who belong mostly to scheduled tribes and scheduled castes (also known as Dalits or Untouchables), the Hindutva missionaries tell them that they too were originally Hindus, only their ancestors were either forcibly or fraudulently converted by foreign-invader Christian missionaries. To motivate the scheduled tribes (8.6 percent) and scheduled castes (16.6 percent) to identify as Hindus, Hindutva holds out the prospect of elevated status; essentially replacing the racial apartheid of caste with religious apartheid -- paving the way for second-class tribals and dalits to become first-class Hindus, superior to any and every non-Hindu. As a pro-independence revolutionary, V.D. Savarkar (1883-1966) -- regarded as the "Father of Hindutva" -- spent many years in prison during British rule. It was in prison, that Savarkar formulated his Hindutva ideology and wrote what is essentially the handbook on Hindutva. Though he despised the Muslims of the Khilafat movement with whom he was imprisoned, I would suggest that Savarkar's Hindutva (first edition, 1923) has actually been deeply influenced by Islam. Hindutva has turned India into a tinderbox of communal tension such that today it takes very little to ignite a fire of sectarian hatred that quickly rages out of control. The goal of Hindu nationalists has always been to secure power at the centre and establish India as a Hindu State where the power and privilege of the Hindu elite will be preserved and non-Hindus relegated as second-class citizens to be subjugated, contained and repressed. The umbrella body dedicated to the advancement of Hindutva is known as the Sangh Parivar. The Rashtriya Swayamsevak Sangh (RSS, National Volunteer Corps). 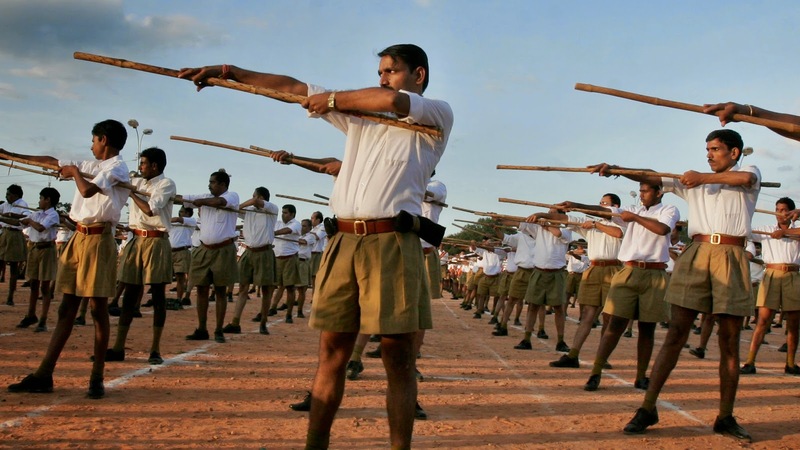 The RSS is a truly massive nation-wide paramilitary force. Founded in Nagpur in 1925 with the mission of creating a Hindu state, the RSS has propagated a militant form of Hinduism as the sole basis for Indian identity. The RSS has access to virtually unlimited funds, as well as a vast network of swayamsevaks (volunteers) and pracharaks (agitators) who can be mobilised in a moment. Great for politics and persecution. The founder of the RSS, Madhav Golwalkar, wrote, "foreign races . . . must either adopt the Hindu culture and language, must learn to respect and hold in reverence the Hindu religion, must entertain no ideas but those of glorification of the Hindu race and culture . . . or may stay in the country wholly subordinated to the Hindu nation, claiming nothing, deserving no privileges, far less any preferential treatment - not even citizen's rights." Nathuram Godse, the assassin who shot and killed Mahatma Gandhi in January 1948, was a member of the RSS. In the dock alongside Godse's was his co-accused: V.D. Savarkar, the "Father of Hindutva". While the foot-soldier Godse was executed, the well-connected Savarkar -- believed to be brains behind the assassination -- was acquitted on a technicality. In February 2003, when the Hindu nationalist BJP were in power, they hung a portrait of V.D. Savarkar in the Central Hall of Parliament House, directly opposite the portrait of Mahatma Gandhi. On 28 May 2014, a day after his inauguration as Prime Minister, Narendra Modi paid tribute to V.D. Savarkar on the 131st anniversary of his birth. Formed in 1964 to advance Hindutva through cultural means -- i.e. through "safronised" education, media, conferences and festivals -- the VHP is regarded as the Sangh's "cultural wing". The VHP's work includes missionary endeavours, including the truly massive, high pressure and sometimes violent Ghar Vapsi (literally: homecoming) conversion / "reversion" campaign aimed at bringing Christians "back into the Hindu mainstream". 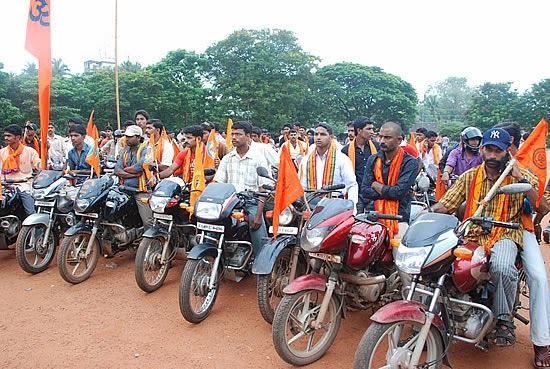 The Bajrang Dal is an ultra-violent youth militia. It was formed in 1984 specifically to mobilise Hindu youths for the Ayodhya campaign to seize control of the 16th century Babri Mosque in Ayodhya, Uttar Pradesh, on the spurious grounds that it was the birthplace of the Hindu deity, Ram. On 6 December 1992, rioting Hindus affiliated with the RSS, the VHP and the Bajrang Dal demolished the mosque. The police did not intervene and thousands were killed in the ensuing violence. The controversy is on-going. The VKP an offshoot of the RSS comprising militant hinduised tribals. The BJP is the political wing of the Sangh Parivar. Founded in December 1980, by 1991 it was India's main opposition party. 1998: In March 1998, the BJP-led National Democratic Alliance (NDA) won the Lok Sabha (federal parliamentary) elections. Running with the slogan, "One People, One Nation, One Culture", and campaigning on a platform that included obtaining nuclear weapons and advancing Hindutva. Persecution escalated immediately, and between January 1998 and February 1999, police recorded 116 incidents of violent persecution against Christians -- more than in all the previous 50 years of independence combined. The increased persecution went unremarked (outside Christian media) until Feb 1999, when Bajrang Dal militants ambushed and murdered Australian missionary Dr Graham Staines and his two sons, Philip (10) and Timothy (6), burning them alive in their car in a tribal district of Orissa. 2004: The BJP-led NDA's first term in office was marked by significant economic development, so political analysts the world were bewildered in 2004 when the BJP was not returned to power. Described in the media as a "shock loss" and "unexplainable", analysts put the BJP's loss down to a widening of the gap between rich and poor that had left multitudes disillusioned. Others maintained that the BJP had diverged from its Hindutva path, losing many Hindutva supporters in the process (when in reality, the BJP's coalition partners had kept it hamstrung). It must be noted, that the Congress-led United Progressive Alliance (UPA) won the May 2004 Lok Sabha elections by the slimmest of margins. 2009: By mid 2008, disillusionment with the Congress-led UPA government was widespread. In July 08 the UPA survived a no-confidence vote by the slimmest of margins. As 2009 approached, the BJP was favoured to regain power at the centre. Then, in late November 2008, Islamic militants from Pakistan staged a daring terror attack in Mumbai that left more than 160 dead. While Prime Minister Singh responded with a cool, diplomatic head, negotiating with Pakistan to ensure the killers would be brought to justice, the BJP responded with rhetoric so belligerent that it scared off every swing voter and doubtless many supporters as well. The BJP's election loss in April-May 2009 was not a sign that support for Hindutva was waning; it was proof that Indians did not want to risk war with Pakistan. All the while, the VHP's tireless cultural work has met little resistance from secular forces reluctant to tackle Hindutva for fear of losing Hindu support. As such, despite the BJP's election losses, despite a decade of Congress-led rule and despite the denials of numerous analysts, Hindutva has continued to gain ground. Today Hindutva's ascendency can no longer be disputed. The 2014 election results will have grave consequences for India's more than 71 million Christians (5.8 percent; although many believe the number is closer to 9 percent) whose persecution will now be sanctioned at the highest levels. It will have diabolical consequences for some 83,000 Indian missionaries who now face that prospect of draconian anti-conversion laws being enacted at the national level. I do not believe that this would require a change to the Constitution. It would only require a precedent to establish that the Constitution's religious freedom provisions are to be understood as freedom to hold belief, not freedom to change it; a position that already has wide acceptance, even at the UN. 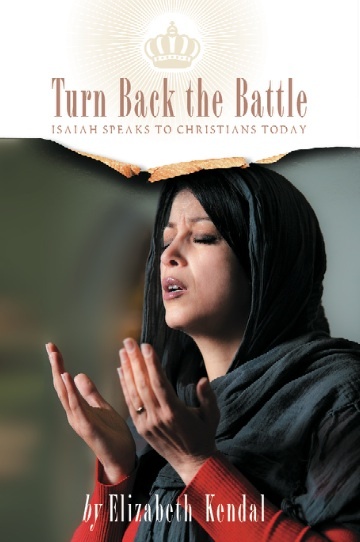 Elizabeth Kendal is a religious liberty analyst and author of Turn Back the Battle: Isaiah Speaks to Christians Today (Deror Books, Dec 2012). She is an Adjunct Research Fellow at the CSIOF, and the Director of Advocacy at the Canberra-based Christian Faith and Freedom. -- the status quo will end in genocide. As noted in RLPB 268, "Papua's predominantly Christian, indigenous ethnic Melanesians desperately need change. However, it is highly unlikely that Islamists or the TNI or all the corrupt business and political elites who reap financial gain from Islamist and TNI business in Papua, will simply give up their ambitions and economic rewards for the sake of those often regarded merely as 'black infidels'. "If change is to come to Papua, it will require profound conviction and commitment in Jakarta backed (or even generated) by a profoundly convicted and committed 'international community', for as in 2000 [under President Wahid], any reform would face considerable opposition [see RLPB 268]. "On the other hand, if there is no reform, if things just quietly go on as they are, then the demise -- the genocide -- of Papua's indigenous peoples is within sight. Of course for many that merely spells 'problem solved'. Such thinking is an evil the Church cannot abide. For 'the Lord's portion is his people', they are 'the apple of his eye' (see Deuteronomy 32:9-11). ‘Otsus Plus’ for Papua: What’s the point? Includes a meeting with outspoken church leaders, Socrates Yoman and Benny Giay. Lured with promises with free education, Papuan children are transported to Java, held captive in Islamic boarding schools, forcibly converted to Islam, given Muslim names and indoctrinated in puritanical Salafi Islam. Years later, only once fully Islamised, these Papuan youths are then returned to Papua as Muslim missionaries. Those who have escaped tell of harsh conditions and cruel punishments. Investigative journalist Michael Bachelard believes the number of children affected is in the thousands. "A six-month Good Weekend investigation has confirmed that children, possibly in their thousands, have been enticed away over the past decade or more with the promise of a free education. In a province where the schools are poor and the families poorer still, no-cost schooling can be an irresistible offer. "But for some of these children, who may be as young as five, it's only when they arrive that they find out they have been recruited by 'pesantren', Islamic boarding schools . . .
"These schools have one aim: to send their graduates back to Christian-majority Papua to spread their muscular form of Islam. "Ask the 100 Papuan boys and girls at the Daarur Rasul school outside Jakarta what they want to be when they grow up and they shout, "Ustad! Ustad! [religious teacher]." . . . This report includes video footage of interviews with two young Papuan boys who had escaped the pesantren and made their way back to Papua, scarred and confused. They report forced conversions, harsh conditions in captivity and cruel punishments. "Their story is more evidence that Christian children are being taken from West Papua and converted to Islam - a practice officially denied after being revealed in Fairfax Media's Good Weekend magazine last year. It also makes clear for the first time that knowledge of the practice reaches high into the upper echelons of Indonesia's political elite. . .
"On arrival at the port in Jakarta, Demianus says the group was taken to a nearby mosque. The children were made to dress in Islamic clothes and taught to say the 'syahadat', the prayer to convert them to Islam. From then on, Demianus was told, his name would be 'Usman'. His original name was 'haram,' or forbidden, the clerics told him. "From the port, the children were taken to different Islamic boarding schools - pesantrens - in Jakarta and the nearby city of Bogor. . .
"As the ethnic Melanesian Christian majority in West Papua is gradually outnumbered both economically and socially by migration from other parts of Indonesia, Papuans see the removal and Islamisation of children as a direct assault on their identity. "But a Muslim bloc within Indonesia's national human rights organisation, Komnas HAM, has made it difficult for the body to mount a full investigation of the issues raised by Fairfax Media - including the existence of a small but active network of agents and middlemen who seek out vulnerable children and bring them to pesantren. It's unclear if these men are paid for their work, or who might be funding it, but there is a suspicion that oil money from Saudi Arabia may play a role." According to one of the traffickers, "All the children are Christian, [and they are] destined for conversion." Finally, the following piece in the Melbourne AGE not only sets out the appalling situation faced by Papuans, but recommends policy changes. Papua has "the last great remaining tracts of virgin forest in south-east Asia. Its wealth in coal, gold, copper, oil, gas and fisheries is colossal. A single mine there is Indonesia’s largest taxpayer. "Migrants from across the archipelago flock to Papua, which hosts the highest economic growth rate in Indonesia. They fill unplanned cities like Jayapura and Timika to bursting; they drive the machinery, staff the hotels and shops, and work the plantations that are transforming once-virgin land into deceitfully green circuit boards. "Papua's wealth does not, however, accrue in the lives of its daughters and sons. The indigenous population generally lacks access to health and education services. Papuans have the lowest life expectancies in Indonesia, the highest maternal and child mortality rates, the lowest educational levels, the highest rates of tuberculosis, and an HIV infection rate that is 10 times the national average and climbing. They are the poorest, the sickest, and the quickest to die. . .
". . . Papua’s indigenous population is perhaps 2 million: 1.25 per cent of the population of Indonesia. The next president may have a hard time diverting attention to Papua. But he needs to. A ministerial-level government development body that assumes responsibility for myriad national, provincial, and district-level services is needed in order to centralise health, education, and other services at provincial levels. This entity would play a co-ordinating role in leading other urgent reforms: curbs on migration are urgently needed, and some migrants may need to be sent back. A moratorium on pemekaran [the splitting of territories] is required. The religious foundations providing health and education services need to be legitimised and funded. The corporate social responsibility portfolios of companies involved in extractive industries require oversight from and synchronisation with such an entity, in order that Papua’s wealth may accrue palpably in Papuan lives. "This entity must also issue sensitive policy recommendations: on the legality of separatist symbols, on the Papuanisation of the police, on lifting unofficial curbs on Papuan military enrolments, and on changing the military’s territorial command structure, which is completely inappropriate for Indonesia’s modern defence environment. The insurgency is so small that it is a law-and-order issue. "Such an entity would report to the governors of Papua and Papua Barat, as well as to the president. It would be staffed by technocrats, and driven by Papuans. My experience shows that for every few no-show civil servants, there exists a responsible one. Papua’s rural schools may be absent of teachers, but they also host unpaid volunteers. Such people not only need inclusion, they need authority. "This entity would also play a role in reconciliation. . .
"But the dead need naming. Suffering must be acknowledged. For Jakarta, this is the least expensive step, and the most politically costly. In the absence of such a truth-telling exercise, fictitious claims will remain credible, especially given government restrictions on foreign reporters. Many a politician naively hopes that this national wound will heal itself. It will not. Papua’s Memoria Passionis compounds over time. Or the incoming president can ignore the issue. Perhaps the problem will fade; not with a bang, but a whimper. Immigration has already rendered Papuans a minority in their land, and more migrants arrive daily. The longstanding failure of health and education services in indigenous areas will hasten their demise. Many believe that this is policy. Or perhaps Papuan frustration will foment into a new insurgency, and the current amateurs will be sidelined by an entity that can raise funds and access quality weapons: an era of roadside bombs and burning fuel depots. "If the next president is serious about Papua, then he must treat Papuans with both the seriousness they deserve and the dignity that they have been denied. For there exist no military tactics that can defeat insurrections in human hearts: another way is needed." Bobby Anderson works on health, education, and governance projects in eastern Indonesia and travels frequently in Papua province. A state of emergency has been declared in Iraq, where the Islamic State in Iraq and Sham/Syria (ISIS) has seized control of the northern Iraqi city of Mosul (the capital of Nineveh Province in Northern Iraq) as well as several areas in hotly-contested oil-rich Kirkuk. The Islamic State in Iraq and Sham/Syria (ISIS) [also known as The Islamic State of Iraq and the Levant (ISIL)] is the rebel force presently in control of Syria's Al-Raqqa Province and Iraq's Anbar Province. See, Raqqa, Syria: Christians in the lion's den. The group split from al-Qaeda primarily over the issue of cooperating with Iran (i.e. with Shi'ites). For al-Qaeda, despite being Sunni and neo-Salafi, has long cooperated with Iran in theatres as diverse as the Balkans and West Africa. For Iran's "Axis of Resistance" stretches beyond the Shia Crescent to include Sunni groups such as Hamas, the Government of Sudan and elements of the Muslim Brotherhood. [Hence Morsi's rapprochement with Iran, which triggered Saudi Arabia's support for al-Sisi.] The jihadist ideologues of ISIS regard this cooperation / alliance with Shi'ites as error and a betrayal of the Salafi-jihadist cause. According to ISIS's Abu-Muhammad al-Adnani, "the leaders of al-Qaida have deviated from the correct path [of anti-Shi'ite zeal]. They have divided the ranks of the mujahedin in every place". The debate actually commenced a decade ago, between Al-Qaeda in Iraq's (AQI's) Abu Musab al-Zarqawi and al-Qaeda's Ayman al-Zawahiri, over the jihad in Iraq. Zarqawi's penchant for killing Shi'ites was turning the Muslim masses away from al-Qaeda, which in turn created a problem for al-Zawahiri. While US and Iraqi forces killed many AQI jihadis, a remnant recovered to become the Islamic State of Iraq (ISI), which subsequently expanded into Syria to become the Islamic State of Iraq and Sham/Syria (ISIS) under the leadership of Abu Bakr al-Baghdadi. The matter was brought to a head in February, after ISIS jihadists assassinated a leading al-Qaeda figure. Sometime between late December 2011 and early January 2012, Abu Musab al-Suri -- long regarded as "the most important ideologist of the global jihadi movement" (Bodansky) -- was released from his Syrian prison cell. A leading figure in international jihad, Abu Musab al-Suri had been captured in Quetta by Pakistani Intelligence Services on the night of 31 October 2005. A few weeks later he was handed to the CIA and reportedly transferred to "phantom prison" on Diego Garcia where he was subjected to "intense interrogation". Divulging nothing, al-Suri was fast-tracked for "special rendition" and in March 2006 was "rendered" to Assad's Syria with the expectation that Syrian Intelligence officers would extract something from him. Assad's release of Abu Musab al-Suri came at the request of Iran, specifically the Quds Force of the Iranian Revolutionary Guards Corp. The plan was that al-Suri would help end the fratricidal in-fighting in Syria by co-opting more jihadis into al-Qaeda's Axis of Resistance-aligned al-Nusra Front which would adopt the al-Suri strategy of attracting and securing local support. Then in late February 2014, ISIS jihadis assassinated Abu Khaled al-Suri, who was Abu Musab al-Suri's closest companion and al-Zawahiri's personal emissary to Syria. From that moment, Zawahiri's al-Nusra Front and Baghdadi's ISIS parted ways, with al-Nusra continuing its fight in Aleppo, and ISIS seizing control of Raqqa (in Syria) and then Fallujah (in Iraq). In April 2014, ISIS escalated the ideological/theological dispute by introducing the Khorasan pledge; there would be no reconciliation. Nine prominent al-Qaeda emirs from Afghanistan, Turkmenistan and Iran declared their allegiance to the new emir of the faithful, Abu Bakr al-Baghdadi -- the head of ISIS -- in what is being termed as the "Khorasan pledge". The defecting emirs have published a lengthy theological thesis in which they outline their position and urge others to follow suit. Bodansky explains: "The emirs allude to the al-Qaida affiliates which were guided by Abu Musab al-Suri into secret cooperation with the Quds Forces in order to sustain their jihad. They [the emirs] refused to accept the excuses of al-Qaida leaders that 'the groups did not have any courage to enforce judgements over those who disobey Sharia, under the pretext of avoiding a clash with the people or due to their inability and incapacity, although they enforced in secret more than did out in the open'. 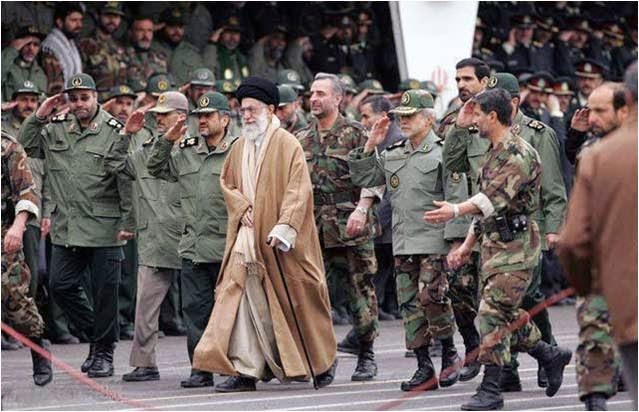 "On the contrary, the nine emirs stressed, the tacit and expedient cooperation with Shi'ite Iran was not limited to the jihadists under duress in Syria but was rather a new trend in the Islamist movement. The most glaring example of the theological corruption of the Islamist-jihadist creed was 'former Egyptian President Mohammed Morsi, who was proven to be an apostate, even for those who had a semblance of comprehension. Or was it an indication of a new kind of jihad?' The emirs emphasize that Morsi's rapprochement with Iran and other apostate states, as well as his refusal to launch jihad against Israel . . . was a conscientious betrayal of the Islamist creed. "It was, the emirs believed, because of this deviation from the right and righteous path that the Islamists lost power in Egypt." Bodansky writes: "The inner-Sunni vicious fighting over takfiri orthodoxy verses cooperation with Quds Forces effectively self-neutralises the Sunni jihadist forces in the greater Aleppo area . . . [Meanwhile] Shi'ite Baghdad is desperately trying to stem the tide. . . Further south, Saudi Arabia and the Gulf Cooperation Council (GCC) are increasingly vulnerable to the Shi'ite ascent . . . The Saudi Ikwhan [Saudi Muslim Brotherhood] is a takfiri creed. . ."
There is little doubt that the split over takfiri orthodoxy is likely to spread to all theatres of jihad. The split will cause sectarian tensions to skyrocket. It will also cause persecution to escalate as the two jihadi branches seek to prove their Islamic credentials for the purpose of recruiting fighters. Considering ISIS is willing to kill anyone and everyone in defence of 'true Islam', al-Qaeda / al-Nusra may well have to escalate its killing of Christians and burning of churches to compensate for its al-Suri-inspired strategic unwillingness to kill Muslims. 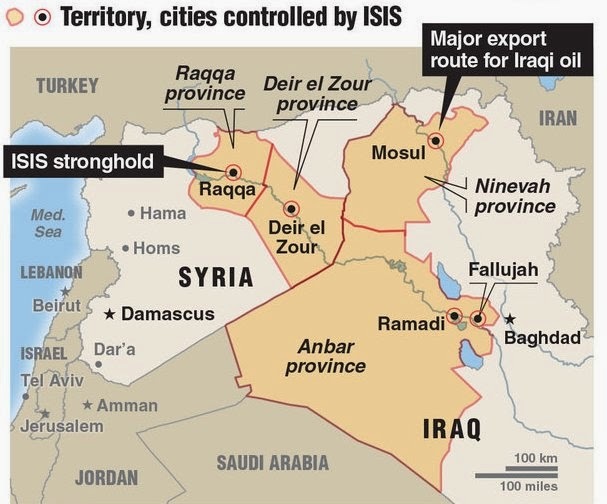 On Friday 6 June some 3,000 ISIS jihadis in technical vehicles (pickup trucks mounted with machine guns) overran the west bank of Mosul, Iraq's second largest city and the capital of Nineveh Province in Northern Iraq. Stratfor Intelligence reports (10 June): "Resistance seems to have ended quickly, with Iraqi army and police units abandoning their equipment and positions. The militants now control the provincial government headquarters, security bases and the airport, along with equipment that was left behind. They also were able to free as many as 1,500 prisoners [figure could be as high as 3,000] who could swell the group's ranks rapidly or at least add to the current chaos." On 10 June, Iraqi Prime Minister Nouri al-Maliki declared a state of high alert in Iraq and asked parliament to approve a state of emergency. According to the BBC, some 150,000 have fled Mosul. 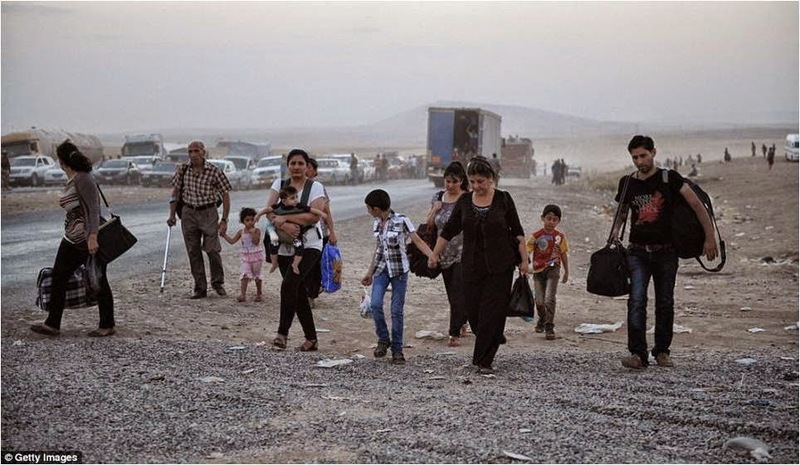 World Watch Monitor (WWM) can confirm that up to a thousand Christian families have fled, for safer areas. WWM reports: "Local media say militants took 70 female students hostage at the University of Mosul, and took 28 Turkish truck drivers hostage in the city. . . One Mosul citizen reported 'No water, electricity or food in the houses now' and "'t is dangerous to go out as there is random sniper shooting in the city'. "Several sources in mainly Christian areas have confirmed that militants have entered their villages too. A local Christian reports that ISIS extremists are now in control of a well-known 'Christian' village in Qara Qosh, where the guards ran away. Another Christian declared that ISIS militants also entered the Mar Behnam Monastery. "Some 200 families, many Christian, are now hosted at the Mar Mattai Monastery and about 50 families an hour are thought to be arriving in Al Qosh, 45km from Mosul, where there is another Monastery. 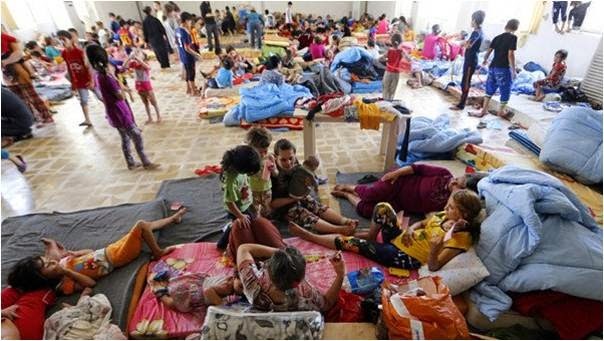 Others have fled as far as Dohuk, 80km from Mosul. "Several schools in mainly Christian villages also opened their doors. New arrivals are desperate for mattresses and blankets, having left carrying only a plastic bag with a few clothes. Some said they had to leave their cars behind at check points and walk for many hours to safer regions.
" 'When this goes on like this, Mosul soon will be emptied of Christians', said World Watch Monitor's source in Iraq, who will remain unnamed for security. 'This could be the last migration of Christians from Mosul'. The Stratfor Intelligence report explains, indirectly, why the situation for Assyrian Christians in Nineveh is so precarious. While restive Sunni Anbar Province fell easily into the lap of anti-Shi'ite ISIS, "Iraqi security forces and Kurdish peshmerga have been fairly successful in protecting the core Shiite region and Kurdish territories." 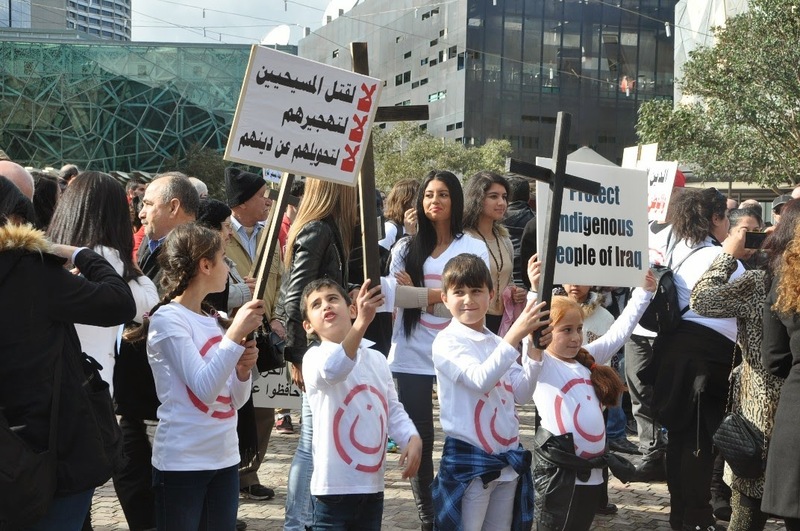 Nineveh Province, however, is a mixed Arab-Kurd "fault-line" region; it just happens to also be the ancient homeland of Iraq's indigenous Assyrian Christians. So who will defend it? Can Baghdad and Arbil (Kurdish capital) cooperate to fight ISIS? Or will Arab-Kurd rivalry get in the way? There is a lot at stake, for as Stratfor notes, "Mosul sits at the heart of the oil-centered territorial struggle between Baghdad and Arbil." On Tuesday 10 June, ISIS seized several areas of hotly-contested, oil-rich Kirkuk, even managing to seize Iraq's biggest (310,000 barrels per day) oil refinery in Baiji. Kirkuk is contested by Arabs, Kurds and Turks. The"stunning collapse" in security has led CNN to question Prime Minister Nuri al-Maliki's ability to hold on to the country. The war has returned to Iraq. With the mother of all battles looming, al-Maliki is offering to arm any citizen who volunteers to fight ISIS. If Christians had any security before, it has certainly all evaporated now. May God have mercy . . .
To search both this blog AND Religious Liberty Prayer Bulletin together, use the search field at the bottom of the page.